Zesty Veggie Pizza is sure to please, especially among vegetarians. Photo courtesy McCormick. This is Page 4 of a four-page article. Click on the black links below to view the other pages. Take advantage of seasonal produce with this grilled vegetable pizza that combines a variety of colorful bell peppers, zucchini, and fresh ricotta and mozzarella. Yields 8 servings. Prepare Marinade Mix as directed on package. Mix ricotta cheese and 1 tablespoon of the marinade in small bowl. Refrigerate until ready to use. Place vegetables in large resealable plastic bag or glass dish. Add remaining marinade; toss to coat well. Refrigerate 15 minutes or longer for extra flavor. Remove vegetables from marinade, reserving marinade. Grill vegetables over medium-high heat 2 to 4 minutes per side or until tender-crisp, brushing with reserved marinade halfway through grilling. Cut into bite-size pieces. Stretch or roll dough on floured baking sheet to a 12- to 14-inch round, about 1/4-inch thick. Brush top of dough with oil. Place oiled-side down on the grill. Close lid. Grill over medium heat 1 to 2 minutes or until grill marks appear on the bottom of the crust. Carefully flip crust over using tongs or spatula. 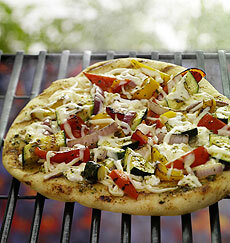 Layer crust with ricotta cheese mixture, 1/2 of the mozzarella cheese and grilled vegetables. Top with remaining mozzarella cheese. Close lid. Grill 3 to 4 minutes longer or until cheese is melted and crust is browned. (Check pizza often to avoid burning. Rotate pizza, if necessary.) Slide pizza onto baking sheet. Slice and serve immediately.